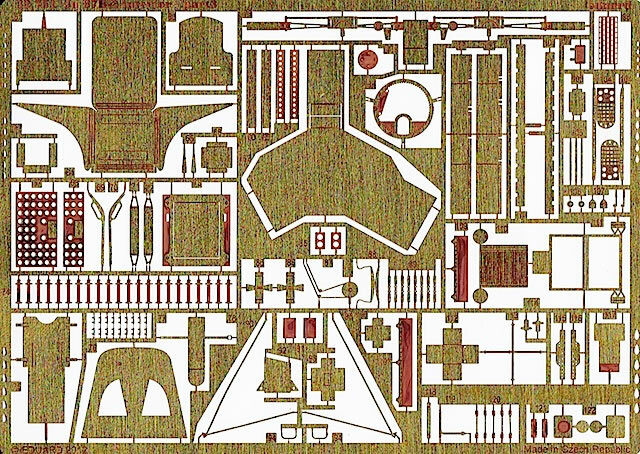 Photo-etched sets offer significantly improved detail compared to equivalent kit parts; mask set will make masking the canopy easier, while delivering better results than most other methods. 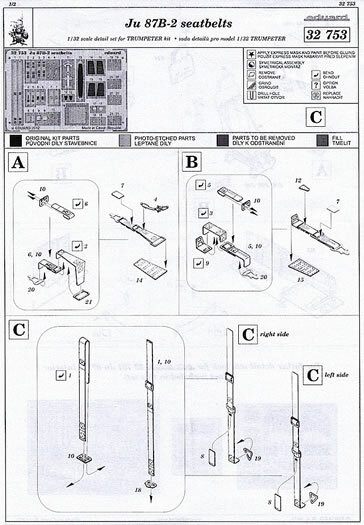 None noted, although experience with using photo-etched parts is recommended. Used with care, all of these sets will significantly improve Trumpeter’s big Stuka. 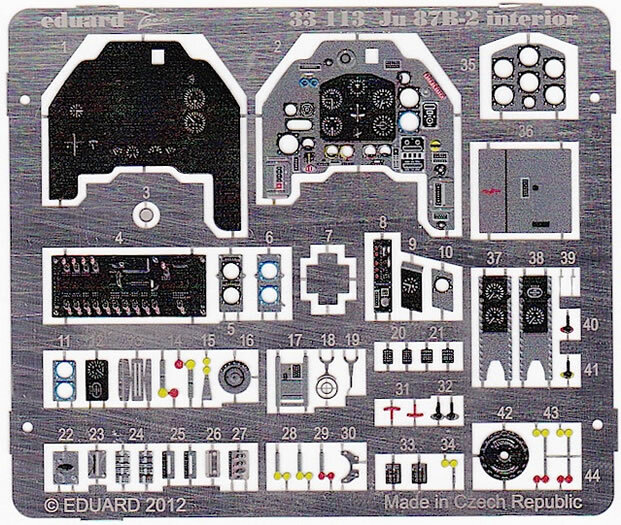 With their typica speed, Eduard has released a suite of products designed to improve Trumpeter’s 1/32 Ju 87 B-2 kit. It’s worth stating up front that these products are not aimed at correcting the big errors in Trumpeter’s Stuka, like the undersized nose or incorrectly shaped spats. Instead they will do what Eduard sets have always done: add detail with a precision that only etched brass can achieve, or in the case of the canopy masks, ease a difficult chore while delivering better results than most other masking methods. 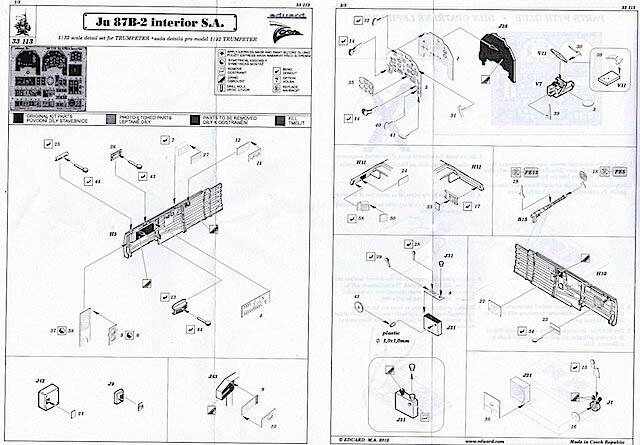 Ju 87 B-2 interior self-adhesive (product no.32751). 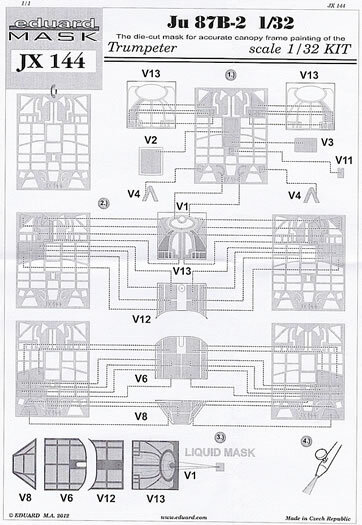 This is the most comprehensive of the sets, with three photo-etched frets containing well over 100 pieces to dress up the cockpit. 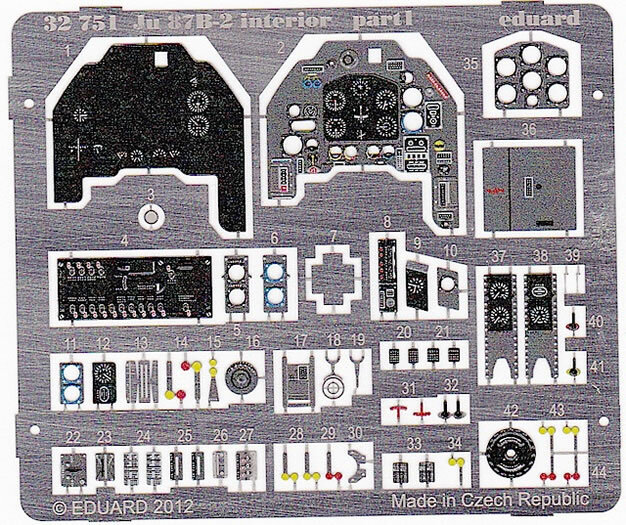 While Trumpeter’s cockpit is OK in terms of detail, careful application of the Eduard set will enhance things considerably. But care is the operative word: some pieces require quite complex folding or rolling (like the replacement seat and oxygen bottle), while others are simply tiny. A photo-etched bending tool will make working with this set much easier, and less frustrating. Two of the frets are both pre-painted and self-adhesive. At the risk of being called a modeling cheat, I really like Eduard’s pre-painted etch because it offers a fidelity that I can’t produce myself – especially with instrument panels. The only problems I’ve encountered with it in the past are occasional issues of registration, pixilation or colour accuracy, none of which are apparent here. 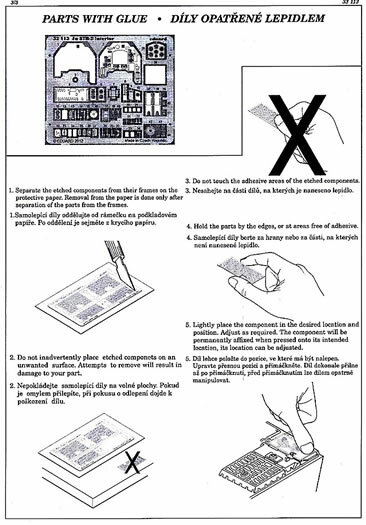 I don’t have any experience with self-adhesive etch (I’ve heard it can be difficult to reposition if this is required) but Eduard provides detailed instructions on its correct use. 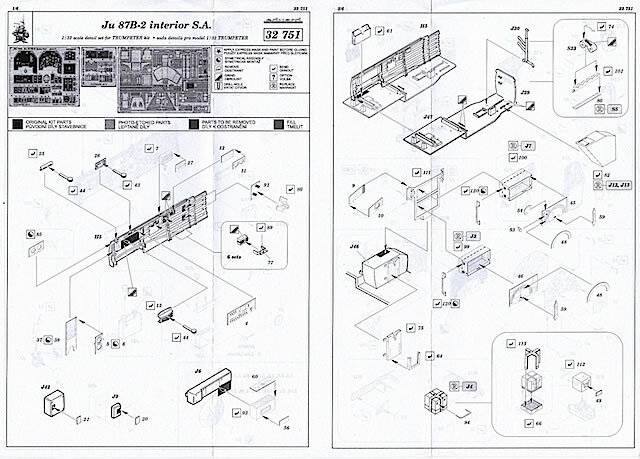 Ju 87 B-2 interior self-adhesive Zoom (product no. 33113). This set caters for modelers who want to add some cockpit detail, but not as much as that offered by the full interior set. As such it contains only one item from the larger set – the pre-painted fret holding the instrument panel, control levers and fuse board, which should add a nice sense of busy-ness to the forward cockpit. 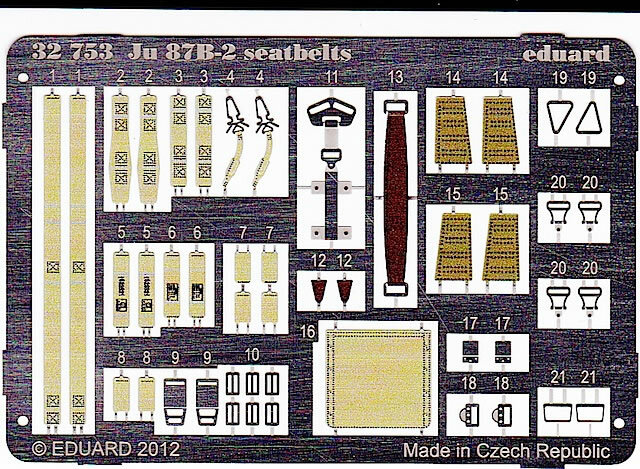 Ju 87 B-2 seatbelts (product no.32753). This set addresses a glaring omission in Trumpeter’s kit, which somewhat unusually doesn’t provide any seatbelts. Almost entirely pre-painted, as is now the norm with Eduard’s seatbelts, the set looks great on the fret and should add considerably to the authenticity of Trumpeter’s cockpit. Care is needed when assembling these pre-painted seatbelts because the finish can be damaged, particularly when you’re bending straps to fit buckles etc. The belts can also be tricky to position naturally, because the pre-painted straps can’t be annealed like unpainted brass (unless you fancy painting them again). But these are minor points only, because these seatbelts are really an essential addition to this model. Ju 87 B-2 mask (product no.JX144). I love Eduard’s modern Kabuki tape masks, and cannot imagine completing a model of this size, with this style of greenhouse canopy, without using them. In my experience Eduard masks almost always fit and adhere well, and leave no messy residue on the canopy when they are removed. 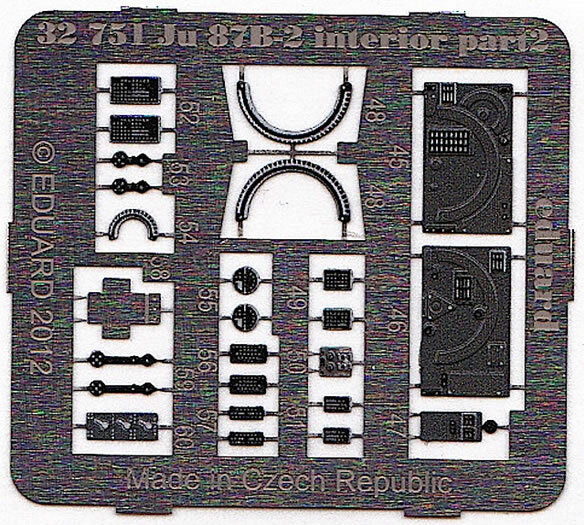 Ju 87 B-2 exterior (product no.32323) – a sample of this set was not provided for review, but a quick look at Eduard’s website shows it to contain a comparatively small, unpainted fret that provides some useful radiator, gun bay and undercarriage detailing. 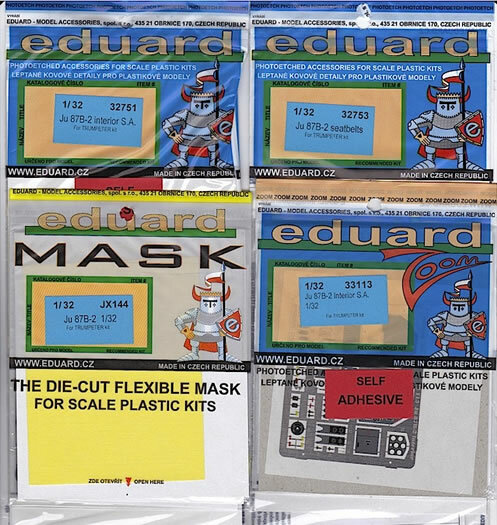 With Eduard’s surge into high-end kit manufacture, it’s easy to forget that the company continues to release hundreds of photo-etched and mask sets like this every year. I’ve used a number of both since I returned to the hobby nearly ten years ago, and have never been disappointed with what Eduard has provided. These sets for Trumpeter’s big Stuka look to be of a similar quality, and I will definitely be using them when I build the kit. Now Eduard, how about some Brassin spats? Or a Jumo 211D with all the trimmings to beef up that undernourished front end?